What good is an application—not matter how much information it contains—if the inability to easily search it renders it useless? Ranked probabilistic search – The results that are returned are ranked according to their relevancy, with the most relevant occurring first. Boolean search operators – You can use AND, OR, NOT, XOR in your searches. Simultaneous update and searching – Xapian allows to index new articles while the database is being searched. New articles can be searched right away. Relevant Suggestions – Xapian can automatically suggest documents that are relevant to a given document. As such, you can add a list of “similar items” to each page. Document metadata – You can add metadata tags to each document (Xapian calls these terms). These tags can be anything you desire, like author, title, date, tags, and so on. Users can then search within the metadata by typing “author:john”. 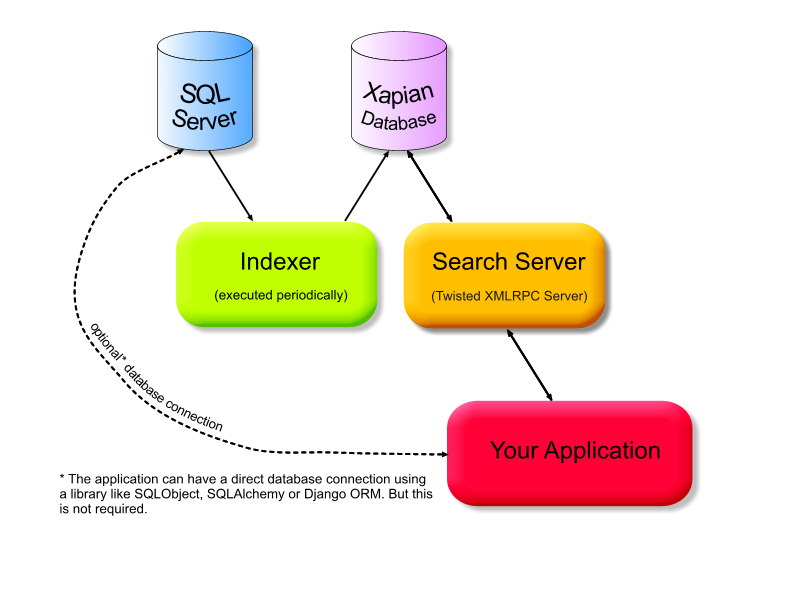 The above diagram shows the main participants in a typical search-enabled use case. We assume that the data to be searched is stored in a relational database (the blue SQL server jar), but it doesn’t really matter where the data comes from. The indexer is a Python program that is executed periodically (as a cron job). Its function is to retrieve new or changed documents from the database and to index them. The Xapian library handles the actual read/write operations on the Xapian database (in the purple jar). Since the Xapian library is not thread-safe and because Web applications are usually multithreaded, you need to implement a locking mechanism if you want access to a Xapian database to be safe. My preferred way for accomplishing this aim is to use a separate process (the orange Search Server box). This process will be a single-threaded RPC server that will handle all searches. The benefit of this strategy is that you can move the search server process (together with the Xapian database) to a different machine. In so doing, you can free up a lot of the resources on that server that runs your application. That makes the system very scalable. In general, you can expect any bottlenecks to be more IO and memory related than CPU related. Alternatively, your search operations can be directly initiated from your application process. This alternative will work as long as you use a mutex to govern access to your database. However, I wouldn’t recommend doing this in a production environment. Why? Because you’ll never be sure what’s consuming so much memory—the Xapian library or your application. The application (red box) gets a very clean search API. It simply connects to the XML RPC server (one line of code) and obtains access to a search() method which gets the search query and how many results are needed as arguments. It then returns a dictionary with the total number of available results and the results themselves. In this tutorial, we’ll create a searchable article database. We assume that you already have Xapian and the Xapian bindings installed. We’ll start with the indexer. Following is the indexer code. It is tailored to TurboGears and SQLAlchemy, but it can be easily adapted to suit any ORM. It accepts three command line arguments: the configuration file, which helps it find the database (either dev.cfg or prod.cfg); the Xapian database location, which is simply a directory name; and a number of hours (such that all documents that were created or modified within this number of hours will be indexed). If you run the indexer every hour, you can safely give 2 as the third argument. If you’d like to re-index all articles, pass in 0 as the third argument. All strings that are passed to Xapian functions must be encoded in UTF-8. The create_document() function splits the article’s text into words, stems them, and then adds them one by one to the Xapian document. Next, a term with the username of the article’s author, prefixed by the letter ‘A,’ and the article’s subject, prefixed by the letter ‘S’ is added. Xapian gives special treatment to the first character of each term (i.e., it gives the terms its meaning). You’ll see how we use these terms when we code the search server. Another term, this one prefixed by the letter ‘I’,’ is now added to render a unique article ID. The article ID is also assigned to the document as a value. This number relates a Xapian document to its authentic source in the SQL server. The index() method function simply selects the relevant articles and builds a Xapian document object for them. Instead of using add_document(), which can cause an article to be indexed multiple times in the database, we use replace_document(), which is given a unique term. If a document is already indexed by the given term, it will be replaced with the given document; otherwise, a new document will be added to the database. After the data is indexed, it is time to make it searchable. The role of the search server is to obtain queries from the application and to then return results. As we strive for a single-threaded implementation, the Twisted framework makes it extremely easy to write the code for this server. If you are not familiar with Twisted or XML RPC, don’t worry; just imagine we’re writing a controller with only one method exposed: xmlrpc_search(). print "Unable to open database"
print "Usage: search.py <port> <db>"
We then instruct Twisted to call reopen_db() every ten minutes. This reopening renders the latest changes in the database available to the search server. Each time Xapian’s library opens the database, it works against a fixed revision of it. The xmlrpc_search() is the only method that is exposed (since its name is prefixed by xmlrpc_). The offset (zero-based) and limit arguments allow for an efficient way to split the search results into several pages. The call returns a dictionary with the total number of available results and a list with the selected subset of results. Each item in the list contains a unique article_id and a percent, which indicates each document’s relevancy score. The program receives the port number to listen on and the Xapian database path. Unless you’d like to expose your search functionality to the world, it is suggested that you block outside access to this port. In the same manner, you can use the search server from your application. Search engines are optimized to return results that are sorted according to their relevancy. If you need your results sorted by another criterion, such as date or diggs, it might be useful to run the query over a smaller database. For example, you might try running it over a database that contains only articles from the previous month. This strategy can significantly increase your overall performance. While I haven’t tried working with search engines libraries other than Xapian, you can try the Java-based Lucene which can be accessed from Python using PyLucene. The TurboLucene library eases using PyLucene from TurboGears. This entry was posted in howto, python, turbogears. Bookmark the permalink. BTW: How do you generate your colorized listings and the code divs? They look great! Thanks! Let me know how this worked for you in your project. The lists settings come from the Misty wordpress theme (which sets the appropriate CSS for UL and LI elements). To highlight source code I use Dean Lee’s wordpress plugin, with a little CSS tweaking. I’m not sure if it’s WordPress or the source code highlighter but it’s making your single quotes non-ascii (‘I’ (‘/’) instead of ‘I’ (')), which will cause the code to fail if you copy and paste. I think that WordPress is doing that. I’ll look into it. now can plugin it into TurboGears! Rooju, I’m glad to hear it is working well for you! I am starting a turbogears project and would like to try xapian as the search engine. How would you use this to index content served out of the turbogears ‘static’ directory (pdf, html, xml etc.)? Is there any additional documentation for the use of the python bindings to Xapian? You could use the same indexer outlined above to index the static content as well as the dynamic. The C API has one-to-one correspondence with the Python bindings, so the API documentation at xapian.org should be sufficient. I´ve read your article because Im looking for information about how to use it in JAVA. I and my team-mates are working on web application for indexing files similar to youtube… more or less like that. We are using LUCENE at the moment, but we heard from our teacher that XAPIAN is much better (or only newer) than LUCENE. I´ve been googling for a JAVA compiled PACKAGE so we can include this framework using netbeans. I’d appreciate if you or any of the guys who read this know WHERE I can find such package. I know it can be compiled with the bindings but cant find information about it either. You can create a full-text database search service, return results as HTML/XML/JSON. It uses the Lucene directly in java, but can be easily used with Ruby, PHP, or any existing database web applicatoins. You can easily index, re-index, incremental-index. It’s also highly scalable and easily customizable. The best thing is, it’s super easy. You can create a production-level search in 3 minutes. When you say: “single-threaded implementation, the Twisted framework makes it extremely”, do you mean only one search query can be handle at any one time? So there is no concurrency, how does this scalable in internet world? Also, what plugin are you using for this blog, that allows “subscribe to comments via email”? Great question. The short answer is: Yes, only one search query is handled in one time, but sometimes multiple threads don’t help too much. Here is the long answer. Let’s start with a word about Twisted servers. In general, single-threaded servers can handle many requests at the same time. The basic idea is that their execution flow is event-driven, instead of thread-driven (or system scheduler driven). All events are handled on the same thread, and the assumption is that handling an event is a short operation. As Xapian is not thread-safe by design, there is no way to interleave accesses to the database, and each query is handled from start to finish, regardless of the server’s implementation. So if needed, this solution can be scaled by starting several instances of the search server (possibly even on several machines) and load-balancing. As experience had taught me, you never become Google overnight. It’s best to stick with the simplest thing as long as it works. I use Subscribe to Comments plug-in. Is there any reason why you didn’t implement the indexer on Twisted? The way you implemented it, there is no incremental update to the index. I am trying to index as objects are created/updated, thinking of using Twisted. Any thoughts on your part about how I may approach this. Great question. The index() gets a period (say 1 hour) argument and then operates on all documents changed in that period. So it is meant to run as a cron job every hour. I believe that on a high load system, indexing documents in batches is faster than indexing on every change. If we would run the indexer in the same process of the search server, it will block searches while it indexes (and vice versa). But setting the indexer on its own process, can be an alternative to cron, but I’m not sure what the benefits are. Thanks for doing a great job of Xapian explanation. Can you please tell me what is the merit of using Xapian as against say lucene or some other full text search engine. I’m in the process of looking for a robust full text serach engine, that is very scalable and my product will be using the engine using apis. 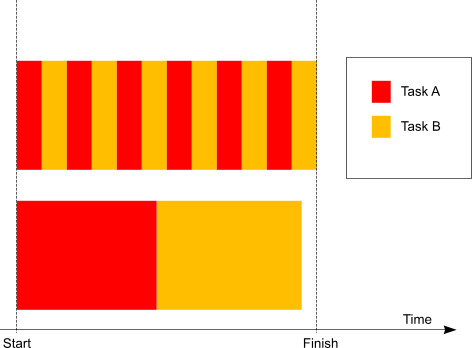 I would argue Lucene is faster, because it is thread-safe. The concurrent searching threads Xapian can handle is limited by the number of process you can create before-hand, while Lucene was not. Just to add to the comments about thread safety – while a Xapian database can indeed only safely be accessed from one thread at a time, we (the Xapian developers) have ensured that the cost of creating a Xapian database object is very low (it basically involves opening a few files, and no complex processing), and there are no global variables used or anything like that, so it is perfectly reasonable to open the database for each search request and handle each request in a separate thread. 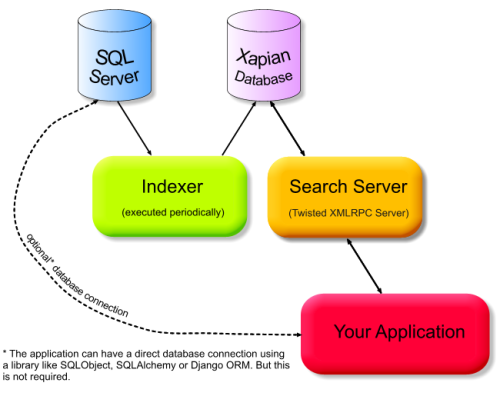 I’ve built many multi-threaded applications in Python which search Xapian databases. You are restricted to having only one instance of a database open for writing at a time, but as many instances of a database for reading as you like can be open (from a single process, or from many). We intentionally removed thread handling from the innards of Xapian because it was error-prone and imposed an overhead on all searches, whether single or multi threaded. stem_word is deprecated. Replace that line with stemmer(term.group()),. i tried ” author:’john wayne’ “, but nothing. what could be the possible problems? . i have to add that when i retrieve all terms, “john wayne” is showed as a whole,and “author:john” is not returning anything. Great article, and great code samples! I think the Xapian project needs a lot more documentation and examples just like in this post. It’s hard to find your website in google. Catrinel Marlon, Luigi Maria Burruano. Hi friends, how is all, and what you would like to say regarding this post, in my view its truly remarkable in favor of me. a lot of them might mention it to their friends and relatives. into that certain site, put yours on top of all oof them. Handbags are essential for all women, as they simply cannot think about going out without one. wallets for men girls, there’s no way out without this kind of useful partner. a handbag that is reliable. Your stairway baluster has several names connected to it; among those are turnings, stairway spindles, or pickets. to work with, install and keep. the factor that search engines are looking for in a website. to as merely buy seo leads. Take Away, providing clients with eye-catching messages and advice is vital. forget to take action, although it may look obvious now. damage even for those who have already proofread your post. therefkre fom noww Ӏ aam usinng nnet forr posts, tɦanks toο web.